Final card of the week is Star-Vader, Cold Death Dragon. 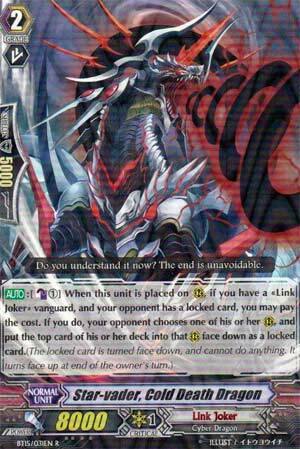 Upon being called, the top card of your opponent's deck is sent, locked, to an empty slot on the opponent's field. Just as long as the opponent controls a locked card. Now, this is supposed to be used to set up Glendios's World End abili- PFFFFFFFFFFFFFFFFFFFFFFFFT oh my sides I hope you're seriously not trying to employ the Ultimate Break as the PRIMARY gambit, because that is unreliable as all get out even with this week's support. Not to mention Cold Death is a terrible ride and a terrible rear-guard, since he has a rather low base power for a Grade 2 of 8k. Cold Death's an all-round lackluster card for a gambit that shouldn't realistically be attempted in the first place. There's Magnet Hollow and whatever filler you could play instead like Colony Maker. Just not this. Please. Final card of the week, and probably my least favorite of them all, but at the same time, it's a real pain to deal with. Yes, it's only 8000. Yes, you will sometimes be forced to ride this unit as your vanguard. And, yes, it really, REALLY blows when you have to. However, the fact remains, this unit is a pain for opponents to deal with. It makes the opponent pick their poison, how do they want to be locked? Do they want to be triangle locked, or would they like to have an attacker? Again, only downside is that rather low attack value, but, then again, you're not trying to use it to attack very often, it's either going to be used as a chump blocker or to set up the finisher for Glendios. Course, if you play Glendios and then four of these, you've got the World's End set up and ready to go. And, no, that won't happen very often. Sure is fun when it does though.